Call me crazy, but January 1st never feels like the first day of the new year. Instead, it feels like the new year is on pause for 24 hours. I usually spend the day relaxing and reflecting on what has been and what may be in the coming year. 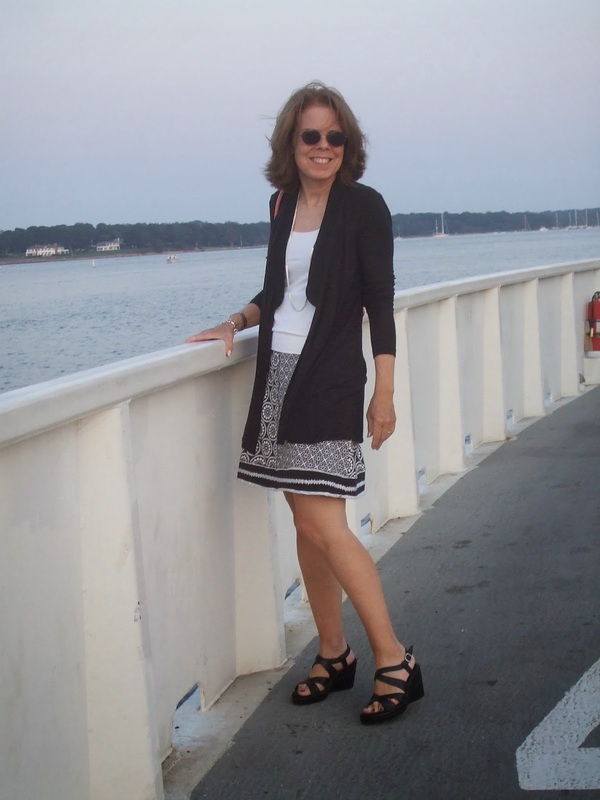 So...today, I'm looking back at some of my favorite 2013 fashion and style trends for women over 50. I've put together a list, though not in any particular order. Does lace ever go out of fashion? Probably not. However, lace garments, especially beautiful lace dresses in jewel colors (ie, emerald, sapphire, ruby), exploded in spring 2013. I took advantage of the lace trend by purchasing a black lace skirt and top (below). When the temperature allows, I wear the lace skirt with a motorcycle jacket for a bit of edge. There's something invigorating about wearing shades of white in the dead of winter. 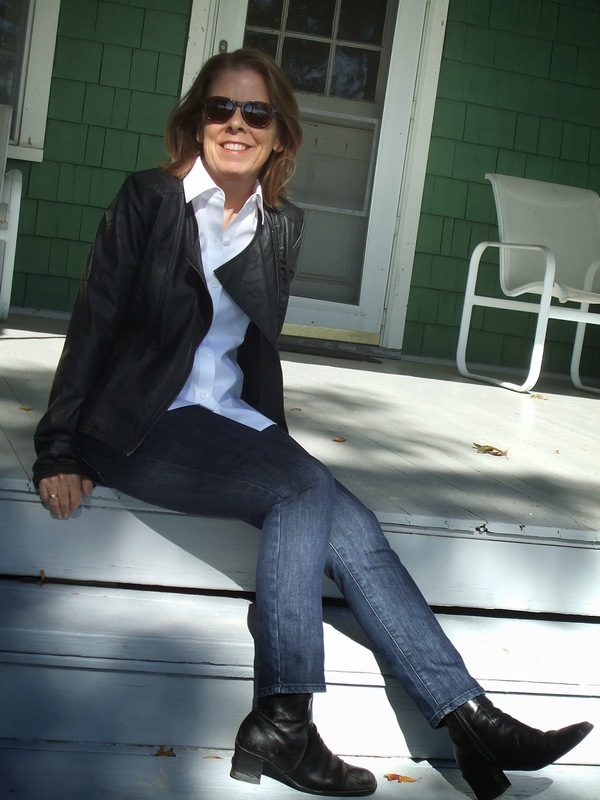 I wore the outfit below the day after our biggest snow storm last winter. All shades of white and beige are trending again this winter. Orange was a super hot color last spring and summer. Unfortunately, orange is not a flattering color for my complexion, so orange tops and dresses were out of the question. However, I spotted a B. Makowsky bag (at the top of post and below) on sale and grabbed it. The big surprise: How versatile the color turned out to be! Orange looks great with so many outfits. Stripes were another huge trend in 2013. Whenever I was in NYC last summer, I saw women in stripes everywhere. I love stripes because they are fun and fresh looking and they look good on women of all ages. A happy fashion day for me is when I discover I already have everything I need to create one of the season's new trends. Last year's black and white trend was a case in point. As a stereotypical New Yorker, I have lots of black garments in my closet. As this post shows, I became a big fan of black and white in 2013. The combination is so simple, crisp and sophisticated. Oh, those over 50 arms! For women over 50 who've seen unwelcome changes in their arms, there's a new sleeve length: the longer short sleeve. Since turning 50, I've relied heavily on 3/4 sleeves for arm coverage. It's so nice to have another choice, especially for summer. No one's perfect and I appreciate my many blessings. That said, I hate my thighs. Until age 50, I wore loose-fitting jeans and dress pants to hide the pair of bulges below my hips. However, baggy pants made me look short, fat and dumpy. So...after turning 50, I stopped wearing jeans (other than for yard work) and my dress pants all together. Fast forward to 2013, when all the colorful skinny jeans were introduced. Suddenly, I felt like a slave to my thigh phobia. I was determined to find a jean style I could feel comfortable in. 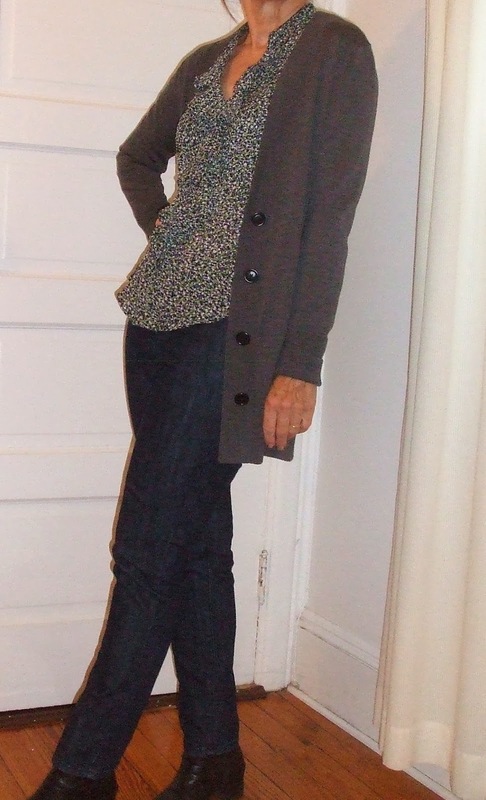 Long story short, I discovered that skinny or straight jeans are flattering for petite women. While the skinny jeans show the shape of my flawed thighs, at least it's an accurate picture. The week after Labor Day, booties took to the New York streets and have been there ever since (except during cold snaps, when tall boots come out). Young women wear the booties with shorts or mini skirts and bare legs. Their booties are often manly, army-style boots. At age 50+, I prefer feminine booties, especially ones with a little heel. I wear booties with skinny jeans or with tights and a skirt. I like to pair tights and booties in the same color scheme. 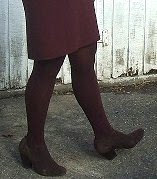 For instance, I'll wear maroon tights and dark brown booties (below). The continuous color theme from knee to heel helps elongate my legs. Sweaters and jackets with bits of real or faux leather were popular among Fall 2013 collections. I love the trend. The pairing of different textures--wool and leather--creates a nice touch of fashion drama. What Were Your Favorite Trends in 2013?